We drew to Whitley Bay 4-4 Yesterday. Were 2-0 up, then they got a goal making it 2-1. We scored to make 3-1 but unfortunately they equalised it to 3-3... then we got another goal in the final period, and they scored their 4th and final goal to equalise 2 minutes before the end. It was a good effort by all involved, and we had a good crowd. Next match is away against Telford on the 16th October! Just got back from our match at Telford. We managed a 6-2 win, well deserved as everyone played very well. We dominated them for the majority of the game. I am also pleased to inform you that we are top of the league ;D! Becky you scored yet ? The Vipers had a fantastic win against Sheffield away today. 5-0 ;D!! Including a fantastic short handed goal (5 on 3)! Great effort by everyone! Because it's not worth winning if you can't win big! It must have been that fantastic training session I coached on Friday night!!! Is that sarcasm I detect??? Vipers play shadows sunday If im not mistaken, nottm had the edge in sheffield but shadows wont take it lying down and no doubt itll be worth sticking your head round onto the public rink if your going to panthers! I'm playing at home vs the Shadows on Sunday too... its a home game for me against Sheffield A team!!! Altho I play for Kingston Diamonds, and we're not doing too well!! Yep, FO's 7.15 on Olypmic. Edit: Thanks Rach, well I can't read!!! or type obviously!! Even though it says that on her tracksuit!! The only times I've heard it pronounced is when she scores which is very often and they usually pronounce it like that so I wrongly assumed it was spelt like that!!! Sorry Julia!! Bex.... its Julia Coughill... I'll have to tell her that one!!! They pronounce it differently in every rink I've been to, and wrong at that!! (Coggill is the correct way). The Away game will be played in Nottingham as they cannot provide the ice time. If we cannot agree a suitable date for both teams we get the points and go through to the third round!! lol. Yeah we won 6-1 at Blackburn. I got thrown out after fighting with Fiona Vorel - not thrown for fighting though, but for having jewellery on which the ref saw when I threw off my gloves!! I forgot to take it off . Just waiting to hear if I have a ban for next Sunday's game too!! Awsome, whatever next- women enforcers?? Was ironic you'd only told us to take it all jewellery off before the game!! We also beat Sheffield 2-0 yesterday, after a delayed start!!! No refs and under 19's game running late! Bit of a bummer but nevermind! We out shot them by about 40! Well played everyone! 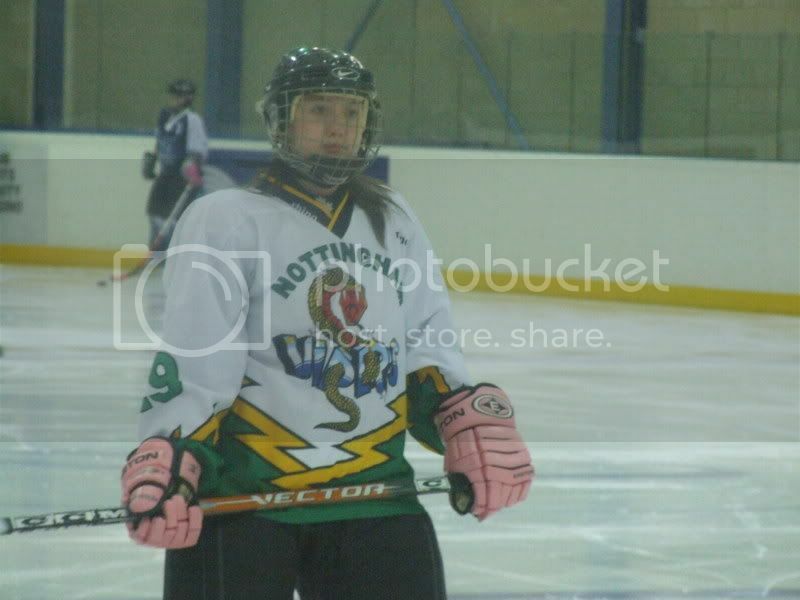 Nottingham Vipers played the game of the season against Billingham Wildcats on Sunday. Both teams were favourite to win the league and this could be the match that decides the league. Nottingham travelled to Billingham with a very short bench including just two defencemen and no coaching staff. A level 2 from billingham sat on our bench for the start of the game then left. The captains ran the bench. The Nottingham Vipers came away with a 5-0 win!! We played absolutely awesome, worked hard for each other, played as a team and put the goals away. It was great. Well done to everyone who made the trip. Great win, I saw Billingham play shadows and they looked a very good team! Well played girls!!! It sounded a great game... sorry I couldn't be there! Was good to see Panthers beat the Blaze though.